Figure 10-1. 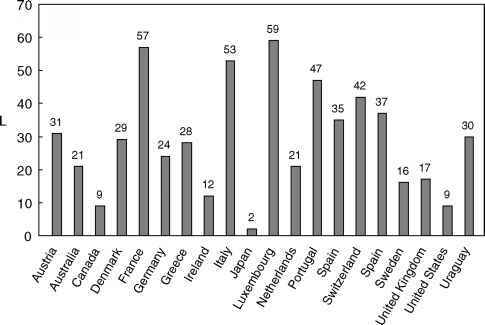 World-wide per capita wine consumption (L per person per year). Adapted from the Wine Institute 2001 Statistics (www.wineinstitute.org). grapes, however, can be grown in California or anywhere else in the world, for that matter, and used to make Bordeaux-style or other types of wine. Although it is common throughout Europe to name a wine after a region, in other countries, wines are ordinarily named after the grape variety from which the wine was made. How a bottle of wine is actually labeled is itself an important issue. Labels not only must comply with local regulations, but they may also reveal useful information on the precise source of the raw materials, how the wine was made, and the expected quality attributes of the finished product (Box 10-1). Assuming that it is possible to successfully grow Cabernet Sauvignon grapes, say, in central Minnesota, which is on the same general latitude as central France, could a vintage bottle of Bordeaux be produced? Or to phrase the question another way, what distinguishes wine made from the same grape but from dif ferent geographical locations? Several answers are evident. First, different areas have different growing soils and climates. For example, in the famous grape-growing regions in France, different districts within the same region may yield grapes with markedly different composition and properties due to differences in soil composition, temperature, moisture, and sunlight. Even different vineyards within the same district may yield slightly different grapes. In addition, grapes cultivated in the same vineyard but harvested at different times within the same season, or from two different growing seasons, may be quite different and yield distinctly different wines. Climatic factors have such an important effect on grape quality and maturity that sophisticated computer-generated meteorological models have been developed recently to allow viticulturists to predict how grapes will grow and mature in a given geographical environment. Few, if any, food labels reveal or imply as much information on the source of the raw materials, when and where the product was made, the manufacturing procedures used, and the overall quality of that food, as do the labels on wine bottles.Wine nomenclature can be so exact that informed and experienced consumers can even predict with some certainty how a particular wine should taste even before the cork is removed from the bottle. Unfortunately, the lack of international conventions on wine standards and labeling has made it difficult to develop a uniform and consistent set of rules and definitions. For example, French wineries are subject to strict regulatory authority by virtue of Appellation d'Origine Contrôlée (AOC) laws, and, as a result, French wine labels can be extremely informative (at least for those who understand what the labels mean). Moreover, European Union labeling laws prevent use of generic labels (i.e., naming a wine after a specific wine region, when the wine was produced from somewhere else).That is, just as cheese labeled as Parmesan must have been made in the Parma region of Italy, so must a bottle of Champagne have been produced in the Champagne region of France. Also, because authentic Champagne (and Parmesan cheese, for that matter) is made using traditional methods, labeling a bottle of wine as Champagne necessarily tells the consumer how that wine was made. For the most part, no such rule exists in the United States, making comparisons between wines from different countries, based on labels, a somewhat challenging exercise. What does it mean, for example, for a California-made wine to be labeled as Bordeaux or Champagne? What follows, then, is a general discussion on the terminology and "appellations" used for labeling wines. In general, there are three types of information on a wine label that provide some indication as to the nature or quality of that wine.Although different countries vary with respect to the specific details (see below), most labels indicate the type of grape (varietal), where the grapes were grown (the appellation), and the owner and/or bottler of the wine (proprietor). Varietal refers simply to the cultivar (e.g., Chardonnay, Riesling, Cabernet Sauvignon) used to make the wine. For many French wines, the variety is not stated, but can be inferred by virtue of where it was made (Figure 1). In the United States (as well as most other countries), the varietal name can be used only when that variety comprises more than 75% of the grapes used in its manufacture. Appellations are essentially geographical designations and refer to the location where the grapes were grown, such as Champagne, Chablis, Chianti, Sherry, and Napa Valley. In France and other European countries, even small sub-regions and villages within the larger regions can be designated. In fact, protecting the geographical integrity of wine is one of the main reasons why labeling laws evolved. Although no law prohibits an American wine manufacturer from adopting a European geographical designation, this so-called generic labeling is merely a marketing device and provides no real information.This practice is now much less of a problem than it was previously. To account for the geographical and varietal properties, most countries have adopted a form of the French AOC labeling regulations. In France, most wines fall into one of three main categories:Appellation d'Origine Contrôlée, Vins de Pays, and Vin de Table.Wines bearing an AOC declaration are those that are (1) produced in one of the designated regions, (2) comprised of specific cultivars, and (3) made according to traditional manufacturing practices. In theory, wines bearing the AOC designation are of the highest quality. Wines produced from grapes from different regions, outside the established AOC boundaries, are referred to as Vins de Pays (wine of the country).These wines are generally considered to be of somewhat lower quality, but in many cases, they are of similar quality as AOC wines. Finally, wines bearing the Vin de Table (or Vin Ordinaire) designation are of the lowest quality.The label makes no mention of the region or area where the wine was produced or of the grape variety. This wine is made in a village called Pommard. 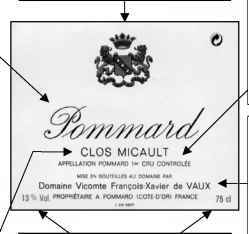 Although not noted on the label (but certainly known to informed consumers), Pommard is located within the Burgundy AOC. This village is part of Cote d'Or, one of five regions in Burgundy (other well-known regions include Chablis and Beaujolais). Note that there is also no mention of the grapes used to make this wine. While varietal labels are common in the U.S., only a few AOC wines (including Rieslings and Gewurztraminers from the Alsace region) contain this information. For other wines, the variety is implicit in the AOC (e.g., Pommard is made from Pinot Noir, Beaujolais is from Gamay). Not only does the label indicate the village within the AOC region, the actual vineyard in which the grapes were grown is also stated (Vineyard Designates). For this wine, the grapes were grown in a walled or enclosed vineyard called Clos Micault. Wine labels should be informative, but also distinctive and unique. A sketch of the vineyard or an image of the family crest are common. Also, there is no year stated on this label. This particular producer indicates the vintage year on a separate label. However, to include a vintage year, at least 85% (higher in some regions) of the grapes must have been harvested from that year. The labeling regulations require that the alcohol content and the volume be declared on the label. In France, the alcohol level for AOC wines vary; Pommard wines must contain 13% alcohol (by volume). The bottle volume is 750 ml, and the stamp at the upper right indicates that the producer has paid the required recycling tax. Note that neither sulfite, nor health warning labels are required in France. The proprietor's name must be listed on the label. For this bottle, the complete family name is given, a gesture meant to add prestige to the wine and to instill confidence to the customer. Also, it is noted that the wine was made and bottled in this winery from grapes grown in this vineyard (i.e., the grapes were not obtained from another vineyard). Finally, in very small print (bottom center), there is a required code or "serial number" that indicates the lot or barrel from which the wine was obtained. Figure 1. Understanding wine labels. The label in the above panel is from a French Burgundy made in the Cote d'Or region. The label on the right panel is from a bottle of Cabernet Sauvignon, made in the Sonoma County region of California. Labels were provided courtesy of the François-Xavier de Vaux and the Ernest and Julio Gallo wineries. Other than declaring the wine as "vin blanc,""vin rouge," or "vin rosé," the label simply states the proprietor and the country. In contrast to most European wines, where appellation is emphasized, the grape variety is usually a more prominent feature of U.S.-made wines. To use a varietal label, the wine must have been made from at least 75% of that variety. 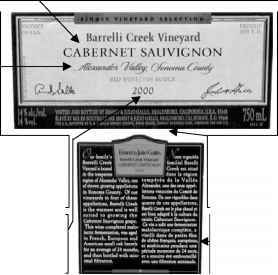 Although varietal labeling is optional, labels must indicate the type or class of wine. This particular wine is a Class 1 wine, as signified by the "Red Wine" declaration. U.S. federal regulations recognize 9 classes; other examples include sparkling wines (Class 2), fruit wines (class 5), and apertif wines (Class 7). The U.S. version of AOC regions are called American Viticultural Areas. The Barrelli Creek Vineyard, where this wine is made, is located in Alexander Valley, one of 11 AVAs in Sonoma County, California. The notation at the top of the label "single vineyard selection" signifies that the grapes came from one vineyard located within this region, comparable in meaning to the enclosed vineyards of Burgundy. The vintage year (e.g., 2000) can also be stated, provided at least 95% of the grapes were grown and harvested in that calendar year. In addition to stating the wine type or class, other requirements for all U.S. wines include the proprietor name and address; the alcohol content (if 14% or higher), and the metric volume. If the wine was fermented and bottled by the same producer, a phrase such as the one used here "vinted and bottled by" can be used. Otherwise, the producer name would be prefaced by the statement "bottled by." Many U.S. wines include optional information regarding the region where the grapes were grown and details on the fermentation and aging conditions. There are two other label requirements for U.S. wines (although not shown here): the "contains sulfites" declaration and the Surgeon General's warning about alcohol consumption and risks to pregnant women and operators of cars and machinery. class or type; e.g.,Table Wine, Sparkling Wine, Carbonated Wine, Citrus Wine, etc., (3) the alcohol content, by volume; (4) the bottler's name and address; and (5) the fluid volume, in metric measurements. If the wine is made from grapes harvested and fermented during a particular year and from a particular region, a vintage year may be indicated on the label. Similarly, an appellation or geographical designation may be allowed, provided that more than 85% of the grapes were grown within the appellation boundaries.The boundaries for these appellations, called American Viticulture Areas (AVA), are defined by the TTB. Most of the approved AVA designations are in California (examples include Napa Valley, Sonoma Coast, and Carmel Valley), but twenty-four other states also have AVA regions. Finally, although some consumers are intimidated by wine labels (especially when they are not written in English), the relevant information can be readily understood, provided one knows a few simple basics (Figure 1). No other issue divides European and American wine makers as much as the issue of "terroir." Terroir, translated loosely from the French as "soil" or "earth," refers, at its most simple level, to the ground or location in which wine grapes are grown. In France, the entire appellation control system that forms the basis for how French wines are labeled is based on terroir.Thus, each of the ten AOC regions has its own terroir (e.g., the Bordeaux terroir, the Burgundy terroir, and so on). In the broader sense, however, terroir theory holds that wine quality, apart from the actual manufacturing steps, is a function of a host of environmental and agronomic factors. Relevant factors include the nutrient composition of the soil in which the grapes were grown,the cultivar of the grapes,the topography of the vineyard, watering conditions, climatic conditions, exposure to sunlight, vine density, and training and pruning practices. Some wine makers might suggest that the specific yeasts that are present on the grapes also contribute to terroir (Box 10-3). On the surface, one might wonder why controversy regarding terroir exists. Is it not unreasonable to expect that wine quality might be influenced by where the grapes were grown? In fact, it is well established that sugar concentration, phenol content, other grape constituents and overall grape maturity are affected by climate, sunlight, and other growing conditions.Thus, on a general level, there is probably not much argument—environmental conditions have a profound effect on grape composition which ultimately affects wine quality. Why the issue of terroir raises concern among enologists, it seems, relates to two other issues. First, there is the view held by terroir advocates that the soil itself contributes to wine flavor by somehow translocating minerals and other soil molecules directly into the grapes.Thus, the wine has the "gout de terroir or "taste of the soil. 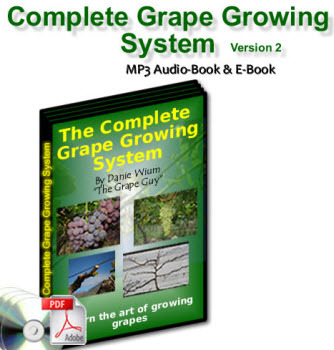 "This claim is generally disputed by many viticulturists, who would argue that grape vines and other plants adsorb water, minerals, nutrients, and other inorganic and organic molecules from the soil, but not flavor compounds. The second issue is more philosophical in nature. Terroir, according to the popular wine writer, Jamie Goode, is considered by many to be an "ethos...a unifying theory encapsulating a certain approach to wine that encompasses the almost metaphysical circle of soil, nature, appellation, and human activity." In other words, it is terroir, and not the skills of the wine-maker, that is responsible for the overall sensory characteristics of a wine. Ultimately, the argument goes, terroir makes a particular wine unique. By definition, therefore, it would not be possible to replicate a particular wine produced from grapes from one region with a wine made from the same cultivar, but grown even a few meters away. Further, and this is probably what really annoys "new world" wine makers, terroir implies or reinforces the perception that "old world" (and French, in particular) wines are superior to those produced elsewhere. Despite whether or not there actually is a scientific basis for terroir, there are clearly considerable market advantages for French wines bearing AOC designations (which are essentially synonymous with terroir).And even though wines produced in the Napa Valley of California or the Finger Lakes region of New York, or anywhere else for that matter, could also make terroir claims, there is little question that it is difficult to match the history and reputation of Bordeaux, Loire Valley, Champagne, or any of the other terroir regions. for wine—the grape—is prone to considerable variability, which may have profound effects on the physical, chemical, sensory, and other properties of the finished wine.